A few weeks ago, we sent out a survey to everyone who has played the Final Beta so far. Here are the results! 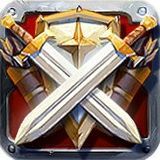 The goal of the survey was to gather your feedback regarding the current state of the game, but also about upcoming features. You have massively responded! Over 7,000 of you completed the survey, and here is what you had to say. Out of all participants, more than 50% own a Veteran Founder’s Pack, 30% have a Legendary Founder’s Pack and the rest owns an Epic Founder’s Pack. When it comes to playtime, 34% played over 50 hours and nearly 75% played more than 10 hours in Final Beta alone. You are also very guild-oriented, with two-thirds of the participants being in a guild and a stunning 41% considering their guild a rather competitive one. Only 9% had no interest in joining a guild at all. But what about player activity? Roughly a third of you still play regularly, meaning you log in at least once every two days. 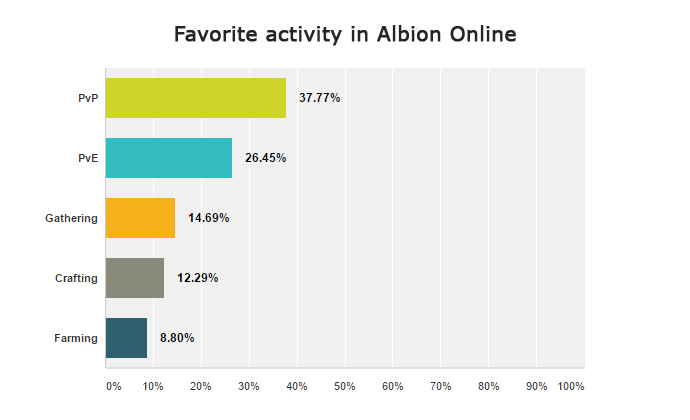 What do you enjoy in Albion Online? We were very interested in your favorite activities in Albion Online. A majority of 38% proclaims to enjoy PvP the most, with PvE following at around 26%. When it comes to PvP, 72% have actively sought out PvP or is planning to. The remaining 28% were either forced to defend themselves against their will, or do not want to participate in any PvP activities at all. PvE-wise, we asked you about your group experience in dungeons. A vast majority of 73% has already ventured into a dungeon with a group, with only 3% saying they have no interest in that part of the game at all. Now on to the most important part of the survey: what can be improved in Albion Online? Depending on whether you still regularly play Albion or not, you were either asked what the game’s biggest problems are or why you have stopped playing completely. Aside from the upcoming wipes, you overwhelming voiced your opinion regarding PvE being unrewarding as it is now. Additionally to that, a lack of time to play Albion’s content was also a reoccurring theme among those who stopped playing the game. We also asked you how important you would rate important changes (Outland Redesign, Performance Improvements, Royal GvG and Albion Arena). All four features got fairly equal interest, with the Outlands Redesign and Peformance Improvements taking the cake. 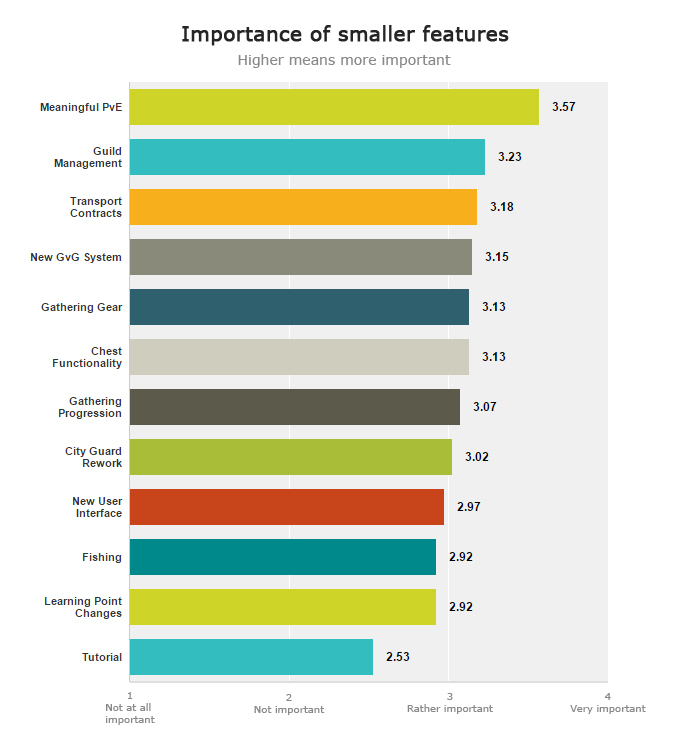 As far as smaller features are considered, PvE gained the most interest again with a whopping 65% indicating that meaningful PvE (better rewards) is very important. Learning Point system changes, a better Tutorial and a fishing feature were not ranked as high – especially for the tutorial not surprisingly, given that most participants in the survey have played 10 hours or more and already know the game. You have voiced you opinion loud and clearly. So what are we going to do with these results? A reoccurring theme was certainly the unrewarding PvE, which is why we have taken an extra interest in making it more interesting, interactive and worthwhile in general. Building on what is already mentioned in our Feature Roadmap for Release, we will change up the way mobcamps work, as well reworking the current dungeon system. We are also working on several events and other features to make the world feel more unique and interactive. On top of that, here is also a reward overhaul planned. For those who do not have time to venture in the Open World, we will introduce special Expeditions for some quick and fun PvE. Of course, Albion Online is more than PvE, and we will continue working on PvP, the economy, the world and general improvements as well. Last, but not least, we would like to thank you for your overwhelming participation and constructive feedback!